An 80-year-old man presented to the emergency department complaining of three days’ history of shortness of breath. He presented with inmobilization due to a thoracic arthrodesis performed three months previously, but did not show any other relevant signs or symptoms. The electrocardiography and cardiac markers were normal, and remaining laboratory tests showed no abnormalities except for a d-dimer level of 6110 ng/ml. 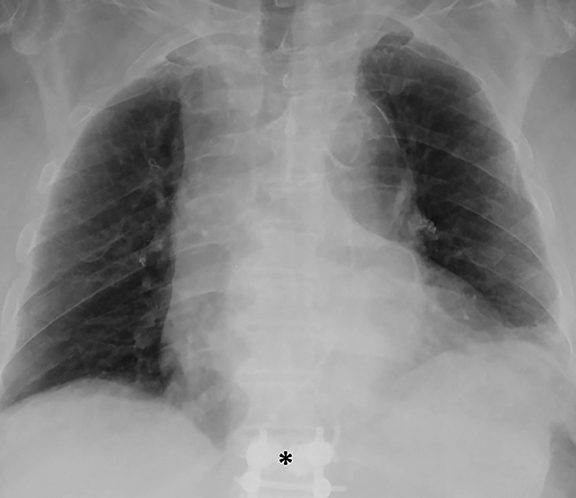 A conventional chest X-ray revealed the thoracic arthrodesis (black asterisk, Figure 1), but no acute cardiopulmonar disease. 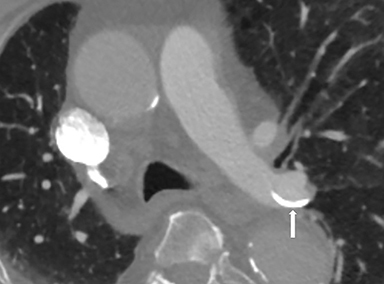 A subsequent computed tomography pulmonary angiography (CTPA) to rule out a pulmonary embolism revealed no hypodense filling defects of the pulmonary arteries. However, the study showed the presence of high-density (around 1000 HU) material, similar to cement, inside the main left pulmonary artery (white arrow, Figure 2A) and inside several bilateral segmental and subsegmental pulmonary arteries (white arrows, Figure 2B). Treatment is controversial, although it is generally the same as for thrombotic embolisms: reperfusion procedures, mainly embolectomy when unstable, and anticoagulation therapy if not.1 Our patient was not treated with anticoagulant therapy because of the high risk of bleeding (he had an abdominal aortic aneurysm of 6.5 cm). However, he experienced complete resolution of the symptoms. Pulmonary cement embolisms are a frequent complication of vertebral cement placement procedures; diagnosis is made by CTPA. Both radiologists and other physicians should consider this entity in all patients with cardiopulmonary symptoms and a previous history of arthrodesis. Walter Alberto Sifuentes Giraldo, José Ramón Lamúa Riazuelo, José Ignacio Gallego Rivera, Mónica Vázquez Díaz (2013) Embolismo pulmonar por cemento tras vertebroplastia. Reumatol Clín. 9:239-242. Kim YJ, Lee JW, Park KW, Yeom JS, Jeong HS, Park JM, Kang HS. (2009)Pulmonary cement embolism after percutaneous vertebroplasty in osteoporotic vertebral compression fractures: Incidence, characteristics, and risk factors. Radiology. 251(1):250-259. Choe DH, Marom EM, Ahrar K, Truong MT, Madewell JE (2004) Pulmonary embolism of polymethyl methacrylate during percutaneous vertebroplasty and kyphoplasty. AJR Am J Roentgenol.183(4):1097-1102. 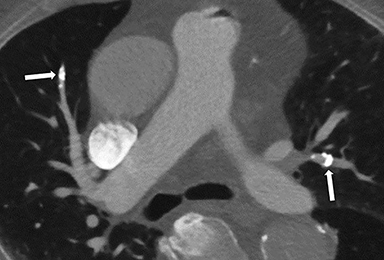 Toru Ü, Coşkun T, Acat M, Onaran H, Gül Ş, Çetinkaya E. (2014) Pulmonary cement embolism following percutaneous vertebroplasty. Pulmonol. [Internet]. 2014:851573. Schmidt R, Cakir B, Mattes T, Wegener M, Puhl W, Richter M. (2005) Cement leakage during vertebroplasty: an underestimated problem? European spine journal. 14(5):466-473. Botía González CM, Plasencia Martínez JM, Solano Romero AP, Gayán Belmonte MJ. Multiple bilateral pulmonary cement emboli. Appl Radiol. 2018;47(11):34-35. Dr. Botia Gonzalez, Dr. Plasencia Martinez, Dr. Solano Romero, and Dr. Gayan Belmonte are Radiologists at University Hospital Morales Meseguer, Murcia, Spain.